Ahh - crisp fresh parsley - a delight to the eye as well as the palate. 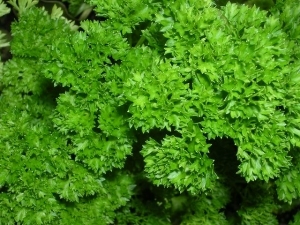 Parsley is closely related to and in the same plant family as celery and carrots. It's origin is in the Mediterranean region of Southern Europe. It is a biennial herb which blooms in the second year. Once you have a mature plant established in your garden, you will hardly need to buy another one since it will reseed itself and produce seedlings the season following the bloom cycle. Grow parsley where it will receive full sun or partial shade. You can purchase small plants at your garden center, or they can be grown from seed directly where you want them to grow and thinned as needed. Try using some as fillers in bare spots of your garden, or as a delightful self contained border for your flower beds. The plants attain a height of about one foot and should be set 8 to 10 inches apart in loose compost enriched, moist soil. Because so much of the leaf surface is exposed, they require plenty of water, especially during dry periods. Once established, a dose of water soluble fertilizer every two weeks or so during the growing season will produce stronger plants of a rich green color. The two varieties of parsley most often used in the kitchen are the popular curly (petroselinum crispum) and (petroselinum neapolitanum), the flat leaf type which has a slightly different flavor. Harvest the leaves before they yellow by cutting the stems at soil level. If you have more than you need, fresh parsley will keep in the refrigerator for several days. Wash and store moist in plastic bags or containers, or simply put cut ends in a container of water on a shelf in the refrigerator. You can also freeze fresh parsley, or dry it (out of sunlight) and then crumble and store in jars. In any case, fresh, dried or frozen, parsley is a wonderful seasoning and healthy addition to a great variety of recipes. Here are some fresh parsley serving suggestions: Mix into fresh green salads. Chop and sprinkle over baked or fried potatoes. Add to soup, stew, stuffing, scrambled eggs, rice, pasta and tomato dishes. A sprigg or two along with a slice or wedge of lemon makes a nutritious edible garnish for a seafood platter. Next time you are at the garden center, pick up some parsley plants or a packet of seed. They are well worth the small effort it takes to grow them.